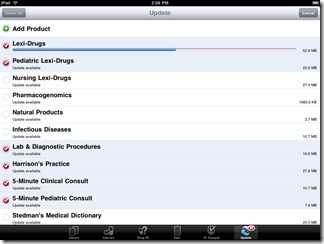 Lexi, a medical information provider for 30 years, is making news by releasing an iPad-compatible version of its comprehensive drug and disease database. This is notable not only because of the depth of its databases but also because it’s beating other medical players to the iPad door – including Medscape, Epocrates and Evidence Central – all of whom have iPhone apps in the market but have not yet released iPad versions. The evolution of mobile computing will help redefine the competitive landscape for point-of-care clinical information solutions. Lexi, a name not commonly heard among the most familiar iPhone medical information apps, has been selling its products to hospitals and physicians since 1978. A look at its website shows that it has a complex, multiple-tiered pricing structure, allowing individuals and institutions to choose which subset of its many databases they want to license. It has also made these databases available on multiple smartphone platforms. In an era where Medscape and Epocrates are offering substantial amounts of information for free, it may be understandable that many medical students and residents have not yet downloaded Lexi’s applications, although their hospital librarians may be quite familiar with them. 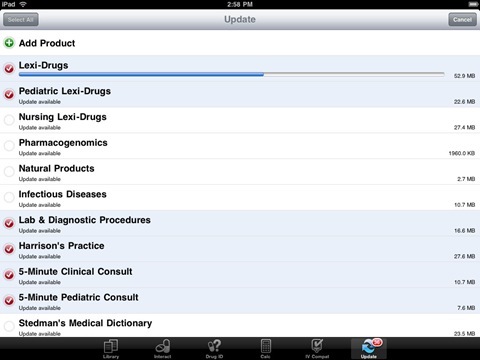 The release of Lexi’s iPad app now gives us a chance to see what they have to offer. Put succinctly – a lot. For the purposes of this review, we were given access to “Lexi Comp”, a comprehensive package of all the Lexi databases which normally would cost $285/year to subscribe. As can be seen by the accompanying screenshot of the setup process, the menu of downloadable databases is quite impressive. 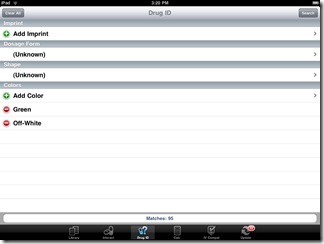 The list of downloadable databases in the comprehensive package includes drug databases, including information on pill identification, dosages and contraindications, which would be familiar to users of Epocrates and Medscape. However, Lexi goes further by making available databases of pediatric drugs and dosages as well as of IV medication compatibility. The latter is actually quite useful for inpatient care, although most physicians are unaware of the juggling often performed by nurses and pharmacists in coordinating the administration of simultaneously prescribed IV drugs. The pill identification module has a nice feature where pill characteristics, such as color and shape can be added individually, narrowing the pool of possibilities with each selection. Adult and pediatric patient information modules are designed as concise handouts to give to patients and families being prescribed the medications. This can be greatly valuable for a busy practice, especially for patients who would otherwise “google” every medication they are prescribed, obtaining information of varying quality and possibly affecting compliance. The comprehensive package also includes clinical information culled from Harrison’s Textbook of Medicine in the form of brief disease monographs, useful for quick review when confronted with an unfamiliar entity. These summaries overlap somewhat between the Harrison’s database and the adult and pediatric “5 Minute Clinical Consult” databases. Both of these allow for user generated text to be appended in a “notes” section at the end. 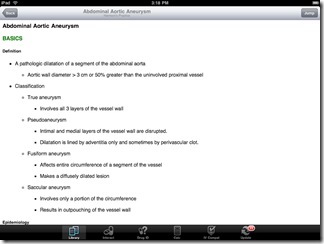 An incomplete list of ICD9 codes is also included. There are also databases of oral diseases and manuals of periodontal conditions as well as databases in Spanish. Among the more impressive databases is a comprehensive list of household products including those used in the bathroom and in the yard, listing active ingredients, what do to in case of ingestion and as well as manufacturers’ contact information. The breadth and depth of the available databases is amazing, I would imagine most individual physicians would only need a small portion of the available databases. 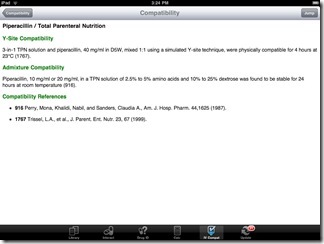 The iPad app was easy to download and provision with the desired databases. Aside from the four items in the navigation bar at the bottom, there was no structure to the application itself to make discovery of the information more intuitive. In particular, the home screen accessed with the first “library” tab was simply a long list of the downloaded libraries. Thus, it is evident that the application is merely a portal to a long list of disparate information and misses an opportunity to add value in of itself. 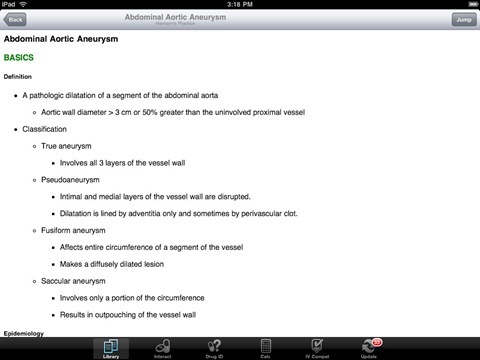 that this is common to other apps ported to the iPad. Perhaps this is an opportunity for the application designers to imagine a new two or three column navigation tool that more efficiently exposes the rich seams of information hidden in the many databases. The inability (yet ?) to print directly from the iPad means that patient information sheets may not be as convenient to give to patients as would be hoped. Finally, Lexi Comp suffers the same issue as other mobile or point-of-care clinical information applications, namely that the physician interacts most intensively with the patient and the electronic health record (EHR) during the all-too-brief patient visit. Requiring the physician to interact with yet a third entity (e.g. Lexi) is less likely to succeed than solutions which incorporate clinical information solutions embedded within EHRs, presumably through partnerships. Currently Lexi offers EHR data integration for drug interactions, expanding this to disease and patient information could add great value. 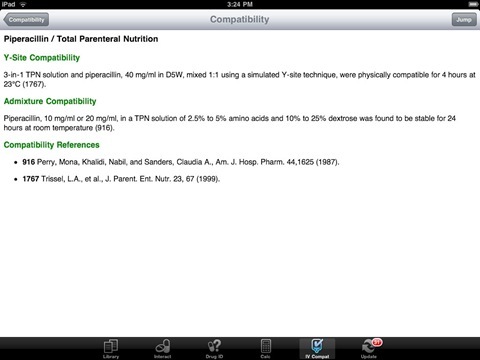 The Lexi Comp application brings together an amazing wealth of clinical information. It has the capacity to help physicians make better decisions and to provide their patients with useful information about medications they have been prescribed. The application serves as a subscription portal to the numerous component databases, which have been presumably refined over the over 30 year life of the company. I would hope that as EHR penetration into office practices increases, more partnerships are created in the future to integrate patient management and clinical information into streamlined applications. You did a disservice by not discussing price. I think Lexi-Comp has to be crazy to think anyone is going to buy this App for $299. I’m sticking with ePocrates and Medscape which offer everything I need, thank you very much. He further went on to say you don’t need to download all the databases, and can pick and choose. We’ve gone ahead and put the price in the conclusion paragraph as well – just in case others misread the post also. You do have great points about epocrates and medscape, both great sources – but the full premium versions of epocrates with the same functionality lexicomp provides is about the same cost. The free version of epocrates is a great resource as well. Lexi Comp is a wonderful resource. Using it on my iPhone and iPad has been useful. Here is my gripe. Once your yearly subscription is up you cannot access the programs databasses and must repurchase another year. I think this is absolutely ludicrous considering my software cost $175. I can understand not getting updates but the inability to even use the software is unacceptable. I only wanted to purchase the Pediatric Drug Reference ($75) but it is packaged with other elements and could not even be purchased separately. I am really angry my software is now disabled. Stick with ePocrates or Medscape. I hope LexiComp is listening to this. Question, does anybody know if it can be installed on more than one iphone or ipad. Example: I need it for me and my wife’s iphone and i’m not planning on buying it twice! can it be done? Apps can be installed on more than one device without incurring additional charges if you are using the same iTunes account. I do not now if LexiComp checks the device ID before authorizing its service, however. I would guess it just authenticates the username/password.